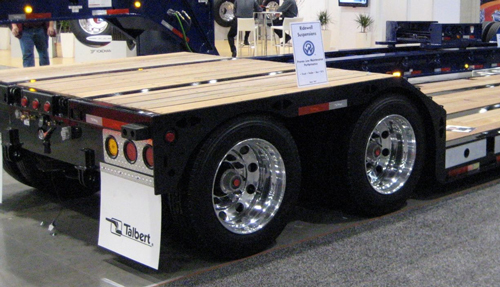 Talbert Manufacturing, Rensselaer, Ind., introduces the versatile 35-ton SRG double drop trailer. The trailer features aluminum pull-outs, which add two feet of space on each side. The unit accommodates wider equipment and at lower heights, which makes the trailer ideal for over-the-road haulers and transportation of large equipment. Consisting of a 48-foot overall length, the tandem-axle trailer has a 29-foot deck length with a rated 35 tons distributed, and 30 tons in each 10 feet of deck length. The 8’6” deck width has the ability to extend to 12’6” with the optional aluminum pull-outs. Additionally, the 35-ton SRG offers a low 18-inch loaded deck height with a 6-inch ground clearance. The 35-ton SRG features a lighter-weight mechanical removable gooseneck design. Air-ride suspension provides added operator comfort for a smoother ride. This customized unit offers heavy-duty T1, 100,000-psi minimum yield steel construction, and a four-beam design for unmatched durability. Furthermore, Apitong flooring outside the main beams offers high performance and stability for every load. The 35-ton SRG can be equipped with optional aluminum wheels, strobe lights, battery backup, and connections for a flip axle.